I can’t believe I’ve never made Thai curry in the slow cooker. I had intended to make Indian curry, but I remembered the Thai curry paste I had in the fridge. I’m convinced that stuff lasts forever, but I didn’t want to take my chances. So, Slow Cooker Thai Chicken Curry was born. Remember her? She’s still as curious as ever. 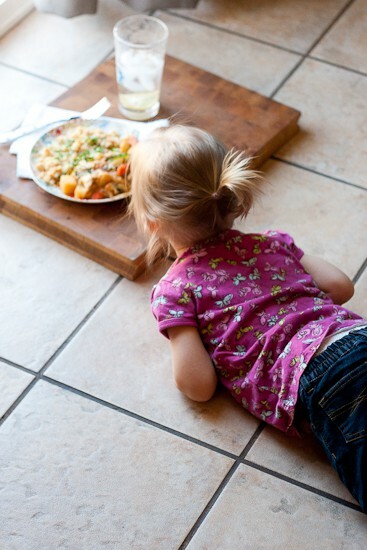 No matter what’s on the floor (where my best lighting happens to be… ahem.) she’ll come over and inspect it. Her impulse control impresses me. Unless it’s a plate of cupcakes, and then, well… she acts like she’s going to explode unless she can rip little pieces out of it. Which she does eventually. I have to tell you, though. This curry really surprised me. 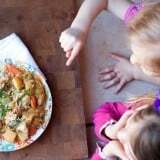 It had so much flavor and was mild enough that my little girlfriends absolutely loved it. The chicken falls apart and the vegetables are super tender. I used zucchini, and was a little bummed that it cooked down to a pulp, but then I realized it thickened the sauce. Awesome. And yes, I used Yukon gold potatoes, but you can use sweet potatoes as well, if you’re watching your starch intake. I also served this with plain cauliflower rice, but I roasted it instead of sauteeing it in a skillet and I LOVE, LOVE it that way. I’ll have to make a post dedicated to that. It’s worth it. 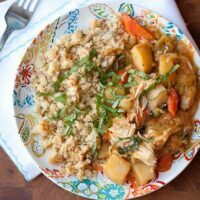 This slow cooker Thai chicken curry is SO flavorful! 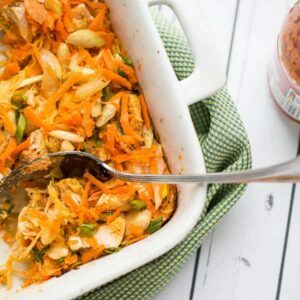 The chicken is super tender and the vegetables create a perfect sauce to spoon over cauliflower rice. Rice (or cauliflower rice) for serving. Heat 1 T coconut oil in a large skillet over medium-high heat. Sprinkle chicken breasts with a generous pinch of salt and add to skillet, searing on both sides until they are golden brown, but not cooked all the way through. Transfer chicken to a 4 quart slow cooker. Add 1 T coconut oil to the skillet, then add the onion and ginger. Cook, stirring occasionally, until onion is translucent and slightly brown, about 7-9 minutes. Add curry paste to the skillet and cook for 1 minute. Add coconut milk, zest and juice from the lime, fish sauce, and 1 teaspoon salt. Heat until bubbly, then remove from heat. 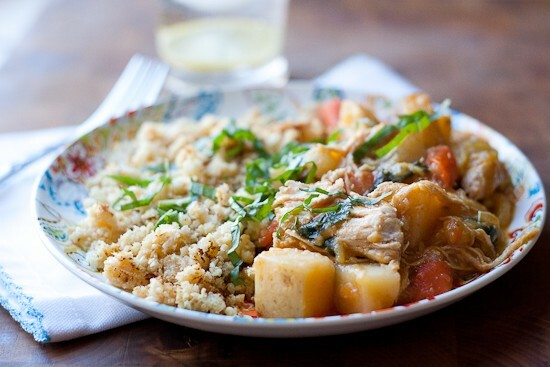 Add chopped zucchini, carrots, and potatoes to the slow cooker. Pour the curry sauce over the top. Remove the chicken from the slow cooker. (If you can. It will probably fall apart.) Shred chicken into large chunks, then return to the slow cooker. Stir in half of the basil a few minutes before serving. Reserve the rest as a garnish. 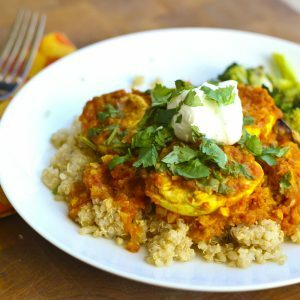 Spoon chicken curry over cauliflower rice, regular rice, or quinoa. Please post about the cauliflower rice. I would love to make it! …and this. I don’t have much luck using boneless, skinless chicken in my slow cooker. Was this moist? My hubby is slowly not liking our slow cooker the more dry chicken we eat. This is absolutely not dry. I know what you mean, though, and I’d had my fair share of dry slow cooker chicken. 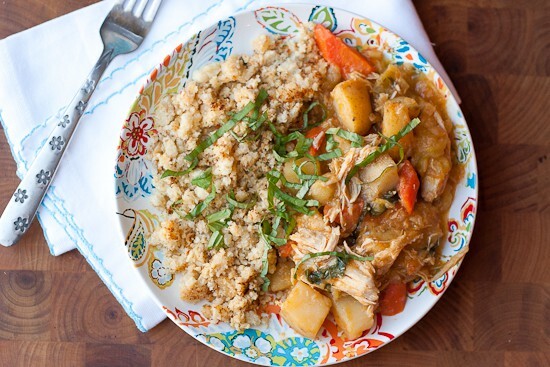 Because the chicken is on the bottom and the vegetables and sauce go on top, there’s enough moisture to keep the chicken from drying out — especially if you shred it a little and stir the chicken back into the rest of the curry. That helps. Also, I’ve found that you can’t let chicken cook forever like you can with a beef roast. I wouldn’t go more than 3 1/2-4 hours on high. Being able to make Thai curry in the crock pot is going to change my life. I have to try this! I am with you. I can’t believe I haven’t made Thai curry in a slow cooker. My slow cooker is my dear friend. I love curry. You definitely have all the right things in the mix here. I give this recipe a Blue Ribbon even prior to trying. I must have purchased the spiciest jar of red curry paste to ever be produced because it doesn’t matter if I just wave the jar near the sauce, it comes out so spicy! And it doesn’t matter how much coconut milk I add, either. Time for a new jar because I want some Thai chicken curry, darn it! Loved this! Made it on Friday while company was here and it was a huge hit for all, including the kids (ages 17 months, 3 1/2 & 7)! I used green curry paste, sweet potatoes and used coconut aminos instead of the fish sauce (I can’t handle the smell while I’m prego). So delish! A new staple for our family for sure!! So good to hear! Thanks for letting me know, Kara! I’m assuming that the instruction to add the vegetables to the skillet should read “to the slow cooker,” right? I’m making this today. Yes! My mistake. Thanks for letting me know. I’ll get that changed ASAP. Could this be made with chicken thighs(boneless)? That’s what’s in the freezer……. I made this today and it was delicious! I left out the potatoes (I’m doing Whole30) and the basil (don’t like) but it was still so yummy! Thank you for sharing the recipe. My husband had one small complaint. I should have double the recipe. =) Thanks for the recipe! Oops. Sorry I didn’t catch you sooner. It should have said “crock pot” instead of skillet. haha. I’ll get that fixed! HI! 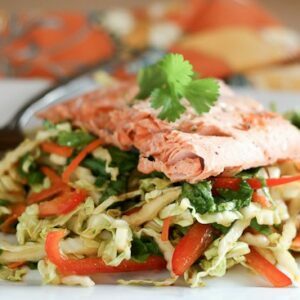 I was curious if I could make this with shrimp instead of chicken? MAybe just add the shrimp to the slow cooker 30 mins before it’s done? What do you think? Next Post »Paleo Baked Fish with Lemon-Basil Pesto and Two Sides!